Truly the time has come for Mr. Annan to go. Even with a report that must be as compromised as Volcker is himself, the circle is complete and the international treachery that coddled Saddam Hussein has been more fully exposed. This is the heart of the story as I have been saying for most of a year: The security council and the countries involved in it were subverted by the actions of the UN and Saddam Hussein on the Iraq question. The UN and the states involved are indistinguishable from the terrorist organizations that they ostensibly sponsored and they have the blood of Americans on their hands. My history of UN OFF posts is here. UN: Kofi pours, Rosett says have a tea party! Fave UN watcher, Claudia Rosett takes on Kofi Annan's latest outpouring of 'reform' talk - and uncovers what should be front page news. The threat of the U.S. withholding cash from the United Nations has sent Kofi Annan into overdrive recently, with the secretary-general putting his name to yet another round of articles proclaiming such stuff as a fresh start and much progress and grand plans for reforming the U.N.--which he is particularly practiced at, having done it twice already, in 1997 and 2002. And proceeds to track stale Kofi as he tiptoes through the mine fields of his own creation. But with the UN, as we've already learned, all roads lead to money. Rosett tells us that just for the core UN budget, the US has been assessed over $400 million dollars this year - roughly ten times the contribution of Russia and China - combined. Given their domestic military funding and the fact that they have permanent Security Council seats certainly should give us pause. But here comes the punch line. Ready? That's disturbing. But if there is one item in all Mr. Annan's talk of reform that should provoke distinct horror, cold sweats, and mighty fears over the trajectory of the U.N., it is a small cipher embedded in Mr. Annan's tastefully printed and expensively bound proposal for U.N. reform, "In Larger Freedom," Annex item No. 5(d). That would be the proposal that developed countries contribute 0.7% of their gross domestic income to the cause of "official development assistance." For the U.S. alone, where gross national income now totals about $11 trillion, that would add up to more than $82 billion per year--by itself more than 10 times what the U.N. has already failed miserably to manage well. And though Mr. Annan does not spell out exactly how such official aid would "officially" reach its intended beneficiaries, the clear implication is that it would go through the "official" U.N.--generating a great gush of cash, with no more need for the U.N. to worry about reform, or Mr. Annan and his successors even to strain themselves sending staffers to lobby Washington, or signing self-laudatory Op-eds. This is simply beyond the pale. Claudia's solution? Throw a Turtle Bay Tea Party. If that means push the whole thing off into the bay and permanently dilute stale Kofi, we are long overdue. You want 0.7% of our GDP Mr. Annan? After what has transpired under your watch, I wouldn't give you 0.7% of the exhaust fumes from my truck. UPDATE: Hoodlumman at FileitUnder suggests the 0.7% was Annan's blood alcohol content when he came up with the UN's latest request for US dollars. Heh. My favorite UN watcher - Claudia Rosett - won the Eric Briendel Award for Excellence in Journalism last night! Claudia, almost single handedly, initially forced the UN Oil For Food scandal into the public spotlight - and we can be sure she isn't finished. I remain hopeful that this award is only the first in a series that this great truth-teller deserves. Though completely ignored by the Liberal Stream Media, Claudia is receiving accolades from some folks in the 'sphere. Michelle Malkin has a good round up post on Claudia's award and the memory of Eric Breindel. Kathryn Lopez has a terrific piece at NRO as well as posts at The Corner. A link from Glenn Reynolds as well. Claudia, please let me add my heartfelt congratulations! - and I know when we collectively get down to the 'Iraq Question' the entire nation will offer you their belated congratulations too. The men, United States citizens who were identified by the authorities as Tarik ibn Osman Shah of the Bronx and Rafiq Sabir of Boca Raton, were captured in early morning raids in the Bronx and in Boca Raton on Friday, according to Paul J. Browne, a New York City police spokesman. This arrest follows fairly closely on the heels of another recent bust of an arms smuggling ring - primarily made up of non-citizens operating in the US - who were willing to sell arms to an FBI informant who told them he was an al Qaeda operative. What can we draw from these events? Here's one thing: David N. Kelley, the US Attorney for the Southern District of NY is doing his job. But there's really something more. New York is not the only place where these things are happening or where our justice department and FBI are active. Certainly there are investigations in progress and there are other examples of domestic terror that have been recently thwarted (here and in other western countries). What we must realize that these things are really just the tip of the iceberg and that they are symptoms of a much wider and more insidious alliance of the progressive left and Islamic jihad. David Horowitz, today, has an article at FrontPage magazine: Vindication: There Is An Unholy Alliance, which provides significant detail about his identification of those on the 'progressive' side who tacitly support our enemy. He links efforts to oppose the Patriot Act, assault our incarceration of terrorists at Guantanamo Bay, open our borders to terrorists - to the same people who are active in funding terrorists organizations and who support and admire convicted terrorists of their own ranks (like Lynne Stewart). David references an interview excerpt that the Iraq News Network conducted in March with none other than 'Gorgeous' George Galloway who was just in Washington DC a couple of weeks ago disclaiming his financial relationship with Saddam Hussein in the OFF scandal. Galloway: "Not only do I think it's possible but I think it is vitally necessary and I think it is happening already. It is possible because the progressive movement around the world and the Muslims have the same enemies. Their enemies are the Zionist occupation, American occupation, British occupation of poor countries mainly Muslim countries. They have the same interest in opposing savage capitalist globalization which is intent upon homogenizing the entire world turning us basically into factory chickens which can be forced fed the American diet of everything from food to Coca-Cola to movies and TV culture. And whose only role in life is to consume the things produced endlessly by the multinational corporations. And the progressive organizations & movements agree on that with the Muslims." So, here's a political 'servant' not unlike some of the political 'servants' in our country that is declaring an alliance between progressive liberals and Islamic jihad. It is difficult to think that many of our own citizens, many with names that we know, want you and me to die and want our families to die - they want us to lose the War on Terror. It is difficult, it is a challenge - but a headline like "British MPs, a US Senator, several US Congresspersons, and several leaders of leftist political organizations were indicted and arrested on conspiracy charges today in connection with domestic and international terrorism..." would be a good start. The First Amendment does NOT protect criminal actions and just as in the case of Galloway - there are money trails and phone calls, meetings and action plans that can be uncovered. I suggest that David Kelley be put on the job. What about it Secretary Chertoff? UPDATE: Ace has a link to the LGF post on Galloway and a good comment thread. Wizbang has a post that links to some great Galloway debunking at Seixon - here, here, and here (at least). 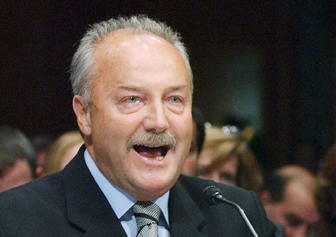 Galloway up for perjury charges? You can't believe your lyin' eyes! UPDATE: RWS has a good summary of a Times UK piece on Gorgeous. 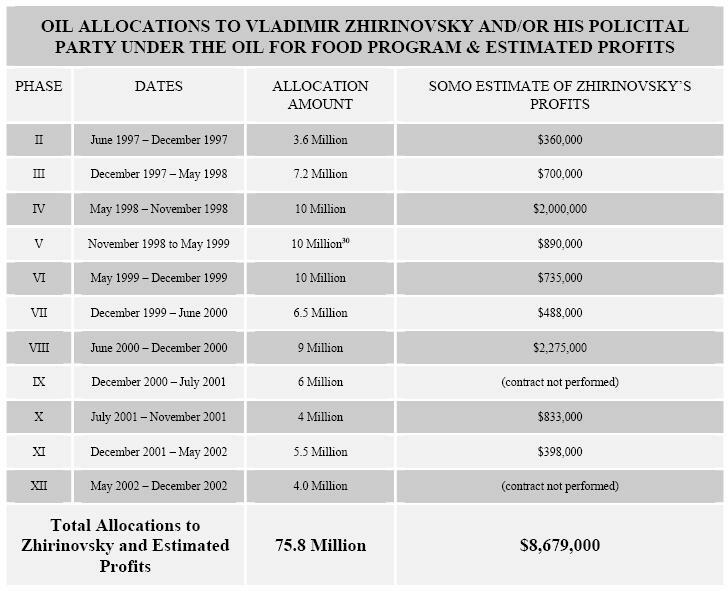 As part of the hearing process being conducted this week by Senator Norm Coleman's Subcommittee on Investigations, new documents have been filed by the subcommitte that indict Russian Iraq envoy Vladimir Zhirinovsky as well as the Russian Presidential Council in the Saddam Hussein Oil Allocation scheme! Soon after the initiation of the Program, however, the Hussein regime used the allocation process to maximize Iraq’s influence around the world. The plan was simple: rather than granting allocations to traditional oil purchasers, the Hussein regime gave priority to foreign officials, journalists, and even terrorist entities. The central purpose of this tactic, according to senior officials of the Hussein regime interviewed by the Subcommittee, was to engender international support for the Hussein regime and against U.N. sanctions. To that end, the Hussein regime favored individuals and political parties from countries that were members of the U.N. Security Council. Senior Hussein regime officials and numerous Ministry of Oil documents confirm that the regime steered a massive portion of its allocations toward Security Council members that were believed by the Hussein regime to support Iraq in its efforts to lift sanctions -- namely, Russia, France, and China. The recipients of the allocations were chosen by a committee of Hussein’s closest advisors, including Deputy Prime Minister Tariq Aziz and Vice President Taha Yasin Ramadan. SOMO documents reveal that these individuals -- along with Saddam Hussein himself -- were personally involved in the process. Some of those documents are presented in this Report. This information was compiled primarily in interviews with (former Deputy Prime Minister) Tariq Aziz, (Former Vice President) Taha Yasin Ramadan and other Iraqi officials - failry recently - mostly in April of this year. The above paragraph from the report spells out - without really saying it - the answer to the real Iraq question: Why did Russia, France, and China (in this instance) oppose the war with Iraq (I didn't say support removing sanctions, support mechanisms of the OFF program)? Because they were in collusion with Saddam Hussein and participating in international treachery with him. The United Nations Security Council for the most part was subverted directly by Saddam - and those countries that opposed the war with Iraq were motivated by their insidious relationship with Saddam Hussein - not their so called political ideologies. How can we continue to participate in - or even allow th UN to function on our shores? On to the rest of this report. Saddam's regime allocated over 30% of its oil allocations to Russia - and gave oil allocations to most of its political parties. The report only focuses on one of these parties: The Russian Presidential Council. 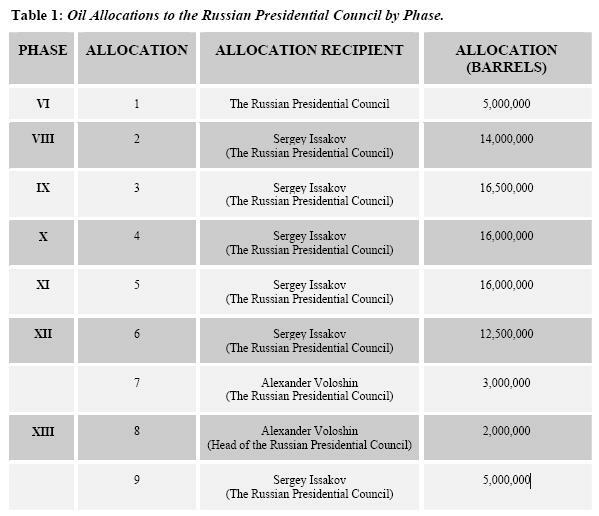 These contracts were executed by oil companies that are controlled by the Russian government. There it is - and remember: this is just one of five recipients of these allocations. American company Bayoil was involved in some of the transactions involving the Russian Presidential Council. There is significant documentation in the report that shows a complicated scheme of payoffs between Bayoil and Saddam's regime, purchasing entities and the Russians. The subcommittee also issued this report, indicting Vladimir Zhirinovsky and his Liberal Democratic Party (the LPDR - which he founded). This anti-Western zealot, made considerable profits from OFF allocations and was also involved with Bayoil. Bayoil is as culpable as any of these political cronies - but the issue is different - they are a company acting independently of the political machinations in the world. The Russian Presidential Council and Zhirinovsky and the LPDR are not. Besides being profiteering scum - they pariticpated in evil international treachery with the world's most recent evil tyrant. It is past time to hold these governments accountable for the lives of Iraqis and Americans that they so callously spent. They have patriots' blood on their hands. UPDATE: Jeff at Protein Wisdom has this about British MP George Galloway's (subject of a subcommittee report last week) blustering in front of the committee - and a plausible, considered retort by Iraqis. If you don't know all the names and background - read up here first. Despite the UN winning a court battle this week (how does a foreign entity - a nation in effect, qualify to utilizes the federal courts of the United States?) to suppress evidence under subpoena by the United States Congress and Senate, the truth is beginning to come out. Despite the federal ruling - former FBI agent Robert Parton who resigned from Volcker's committee in protest - had already provided documentation (including audiotapes apparently) that reveal details about Kofi Annan's connection with son Koji's Cotecna - and said details have not been contained in previous Volcker committee reports. He had provided the documentation to Representative Henry Hyde's International Relations committee. Volcker has contacted Hyde and asked for the documents back. Hyde has refused. "It is essential that it also protect the integrity and the confidentiality of the independent investigating committee," Volcker told reporters in New York, saying the probe involved "highly sensitive matters." "Lives of certain witnesses are at stake," he added. "We're not playing games here, we are dealing, and let me just emphasize this, in some cases, with lives." Is it just me or does it sound like he is threatening somebody or more than somebody? Then today, it has been reported that Kofi Annan did not disclose meetings that he had with Cotecna during interviews with investigators - and only changed his story when confronted by his own calendars that were turned over to Parton. Parton also obtained other testimony regarding Annan's meetings with Cotecna as well. We're getting closer to this part of the truth. In the midst of all this - in the middle of the night last night - Norm Coleman's Senate Committee - the permanent subcommittee on investigations issued this report (requires Adobe Acrobat reader) that effectively charges former French Interior Minister Charles Pasqua and British member of Parliament George Galloway with accepting oil allocations under OFF - and with having a relationship with Saddam Hussein. Coleman's committee is convening next week and Galloway is saying he will attend. He is vociferously complaining that he is innocent. No word at this point if Pasqua is going to show. His diplomatic adviser has been arrested and is now being questioned by a French judge. The investigation into French owned bank BNP-Parabas (that handled all OFF transactions) is continuing as well - and if nothing else - is guilty of gross negligence - but possibly of collusion with terrorists. Developments are so rapid that it could become confusing if you haven't kept up with the story for the long term. But the fundamental issue is still this: It's the Iraq question. Each day it becomes more clear. Did Saddam Hussein and United Nations personnel, along with politicians and citizens from other countries use the OFF program to subvert action by the United Nations and oppose United States action against Saddam? Did I say that it is the Iraq question? The United Nations has the blood of Americans on its hands. This cannot stand. Of course, if you read CNN you wouldn't know about any of this - they'd rather talk about the Wendy's chili finger on their internet front page than international treachery. It's possible that audio tapes exist that implicate Kofi Annan in the OFF scandal. Investigator for the Volcker Independent Inquiry Commission (IIC) Robert Parton (former FBI agent) and an assistant Miranda Duncan resigned from the Volcker commission after Volcker's last report that 'exonerated' Kofi Annan. The committee's chairman, former Federal Reserve chief Paul Volcker, has been calling senators and congressmen, urging them not subpoena the investigator, Robert Parton. In the calls, Volcker has emphasized the confidentiality agreement in Parton's contract and the U.N.-appointed committee's diplomatic immunity, said Mike Holtzman, a spokesman for the Volcker committee. Senator Coleman now wants Mr Parton to testify to his committee but is being frustrated by Mr Volcker who, with the backing of the UN legal affairs division, claims diplomatic immunity extends to all past and present members of his inquiry and overrides the authority of any congressional subpoena. Speaking on CNN's Late Edition, Senator Coleman said the effect of Mr Volcker's actions was to undermine the credibility of the UN inquiry. He said his Senate committee, which is conducting its own investigations into the oil-for-food program, wanted to "visit Mr Parton". He said any confidentiality issues could be worked out. "If you're going to have transparency, if you're going to have credibility, we should have an opportunity to speak to this witness (Mr Parton) to find out whether in fact he had information or he submitted a draft of a document that showed greater culpability (of Mr Annan)," Senator Coleman said. "I'm very disappointed that they (the UN) are asserting some kind of immunity to make it difficult for us to do that. Does he (Mr Parton) have evidence, did he issue a report, did he have any tapes that show something very different from what the Volcker committee released? "Here's a guy that resigned on principle, a former FBI agent, a man of high principle, one of two people who resigned. We should have the opportunity to speak to him." Looks like the UN's theory of 'diplomatic immunity' will be tested shortly. At least two other congressional committees are considering subpoenas for Parton and Duncan as well. This bluster from Volcker really shouldn't be surprising - after all he's compromised in the first place. Looks like it will turn out that his report was a whitewash after all. Of course, now that it is clear that the founding of the OFF program itself is mired in greed, graft, and international treachery - there could be far more at stake than Annan's culpability in terms of what Parton and Duncan know. Dear Senator and congressmen - please do not compromise on this. Please continue your drive for justice and rid us of this scourge on the earth. H/t to the inimitable Ace of Spades for the Australian link. UN: How can we abide this? Last week, the US attorney's office in New York (among other action) filed a complaint for the arrest of Tongsun Park, a South Korean (the same Tongsun Park that was accused of influence peddling in the 1970s "Koreagate" scandal). The complaint alleges that Park acted as an intermediary between Saddam's Iraqi regime and the United Nations and as a bag man for Iraqi bribe money designated for high ranking United Nations officials - for the purpose of founding the United Nations Oil For Food Program. Some things are worth repeating: The Justice Department of the United States is bringing a prosecution that demonstrably shows that the inception of the United Nations Oil For Food Program for Iraq was founded on the same greed, graft, treachery, and kleptocracy that characterized the execution of that program. Except for FOX news, the Park story was given light treatment by the left stream media in the midst of charges brought against people associated with a Houston based oil company charged with illegal involvement in the OFF program. Apparently none of the players in the Park case have the last name 'DeLay'. So, in regard to the Park matter, who are the players? Park - An illegal Iraqi agent. Samir Vincent - An illegal Iraqi agent who is now cooperating with the US attorney since his indictment in January (yep, 2005). U.N. Official #1 - Someone who Park, Vincent, and one or more Iraqi officials met with on one or more occasions in Manhattan and Geneva, Switzerland who needed to be "taken care of". U.N. Official #2 - Someone who Park, Vincent, and one or more Iraqi officials met with on one or more occasions who needed to be "taken care of". This official also has a son who Park assisted with $1 million in cash to start a business in Canada that later failed. Iraqi Official #1 - A representative of Saddam's Iraqi regime who was present in meetings in Manhattan and Geneva, Switzerland. Iraqi Official #2 - A representative of Saddam's Iraqi regime who was present in a meeting in Geneva, Switzerland and who made many decisions in the relationship between Iraqi Official #1, Park, and Vincent. Iraqi Officials - Other representatives of Saddam's Iraqi regime who directed the drafting of agreements to supply $15 million - $5 million to an account designated by Park and $10 million to an account designated by Vincent and Iraqi Official #1 - upon the inception of the Oil For Food program (UN Resolution 986). Former US Government Official - This official was kept apprised of the work that Vincent and Park were doing to help create the OFF program. Current US Government Officials - Were persuaded by the former US government official to support the creation of the OFF program. Though only Park was officially named in the complaint (Vincent is designated as CW-1 - Cooperating Witness 1), presumably the United States Justice Department knows who each of these players are - they have witnesses (more than just Vincent), they have meeting details, agreements, $15 million known to be designated as bribe money, identification of bank accounts that funds were presumably wired to, a ranking US official that knew something about the illicit creation of OFF, and his efforts to win approval from current ranking officials, and records of Iraqi oil contracts awarded to Vincent. In other words - a smoking gun linking Iraq and the United Nations in international treachery. Fundamentally, the reason that Saddam Hussein regained sufficient strength to become a threat to the world and had to be removed from power is because of this alliance between Saddam's regime and the United Nations. At this point there is no doubt that the United Nations has the blood of Americans and Iraqis on its hands and that it represents a clear and present danger to the security of the United States. What possible reason is there to refrain from surrounding the foreign land of the United Nations buildings at Turtle Bay with US troops and placing all ranking United Nations officials under house arrest and prosecuting them in military court as war criminals? No claim of diplomatic immunity can trump being accountable for American lives.